Ellie Wiseman is using multiple visual aids to help students understand the unit, including this poster that lists the unit title, major assessments, essential questions and building skills. 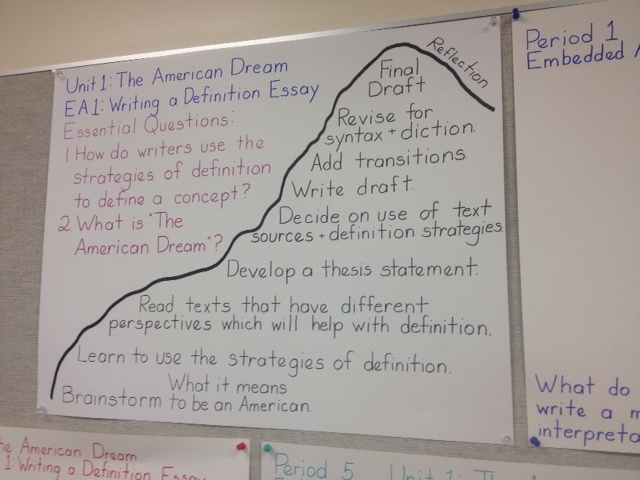 In the Springboard Curriculum, each unit begins by having students examine what they will need to know and do for the first major assessment (known as the Embedded Assessment, or EA). The process used is known as “unpacking.” Teachers will “unpack” approximately two assessments per quarter in English classes. The goal of unpacking is to make very clear to students the purpose of the lessons and the expectations for the summative assessments. 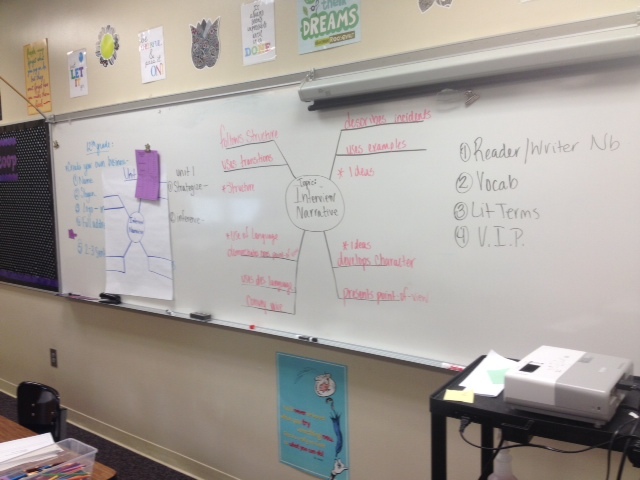 Ideally, teachers will facilitate the unpacking of “skills and knowledge” through a combination of close reading of the rubric and/or assignment description and then the creation a visual “map” to be displayed in the room. The strategies used and the look of the unpacked EA might be different, but ultimately, the important thing is that teachers refer to the expectations often and link lessons explicitly to those expectations. Mandy Bruney is posting the unpacked EA and then connecting it to the daily lessons via the learning targets. Each lesson, she will write the learning target on a sentence strip and begin the lesson by placing it on the red, yellow, or green poster depending upon how the class feels about the target. 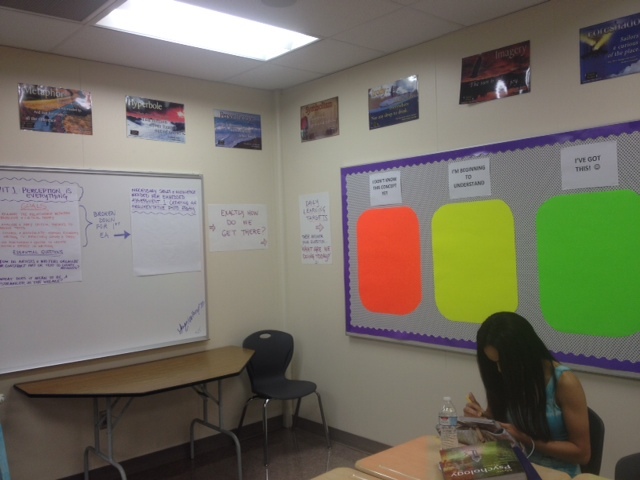 Then at the end of the lesson, she will move the learning target to where students feel they ended the lesson. This helps teachers to answer the question, “Why are we doing this?” It also helps students see how the learning is meaningful and relevant to them. Circle the skills (verbs) and underline the knowledge (nouns) in the “proficient” category or the embedded assessment description (or both). The proficient category is where the students tend to group (according to the bell curve); instruction is targeted to the proficient. Later, you can look at the adjectives in the “exemplary” category if you choose to do so. Some teachers have also just unpacked with what students are going to do “write a topic sentence” for example. They could also be written more in the form of learning targets (I can…). Christine Billirakis used the web to unpack the definition essay for eleventh grade and listed out what students would need to do by category on the rubric. Mountain- List out the skills and knowledge as “I can” statements on note cards and place them at the bottom of the mountain. Move the note cards after each lesson. Stoplight- List out the skills and knowledge and have students place the skill as green, yellow, or red on the stoplight. 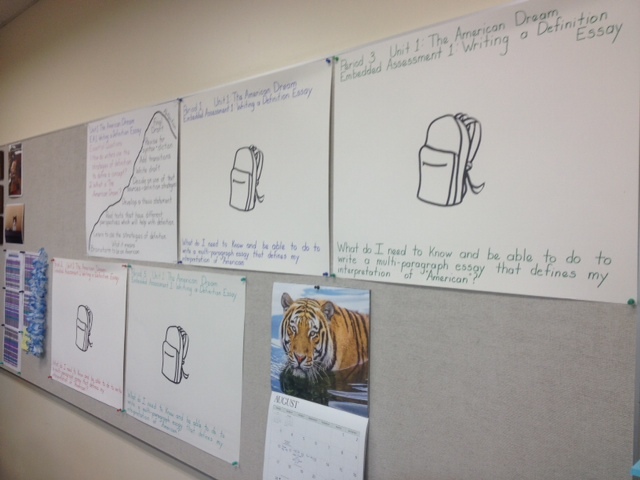 Wiseman listed the description of the Embedded Assessment on the poster and will later go in and create the “skills and knowledge” portion with students. 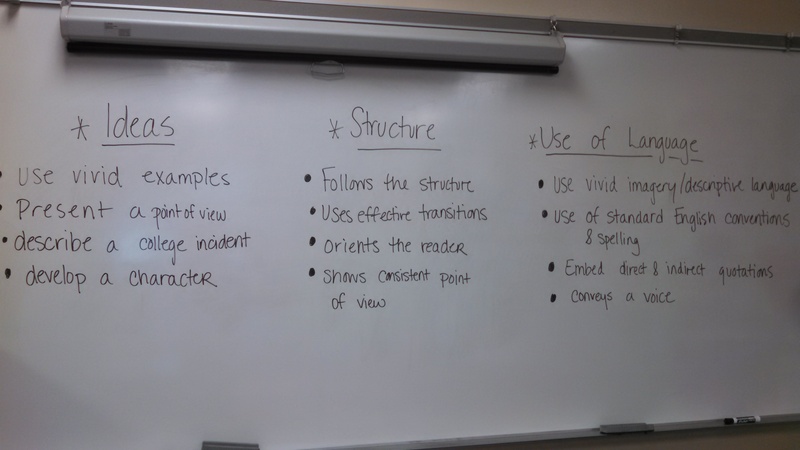 Renee Jackson broke students in her ninth grade English classes into groups and used the jigsaw strategy to have each group examine a portion of the rubric, write out the skills on a graphic organizer, and then present findings to the class. I wrote the lists on the board for other students to copy as they presented. Teachers may have students write skills and knowledge on post its (one per sticky note) to put on a group stop light, mountain etc.